i feel almost compelled to dress up and get all fancy whenever i put this skirt on. i guess on the other side, you can't really dress it down and make it more casual, it would just look negligent. 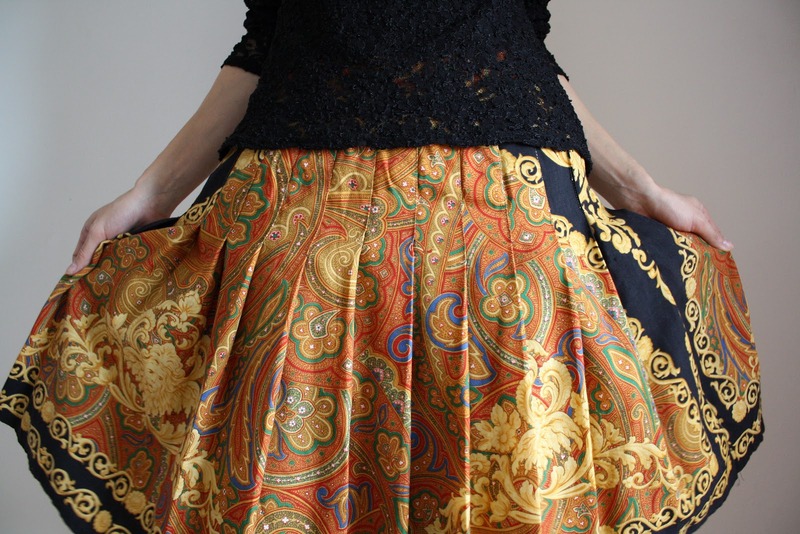 the richness and thickness of the fabric, the amazing colors, the pleats, the print, now this is a skirt to be celebrated. it's a vintage beauty i picked up in paris a few months ago and it's one of the most beautiful statement pieces i own. i wanted to channel the inner parisian in me and so i opted for a delicate lace blouse worn with a basic top underneath so it wouldn't be too revealing. went for black tights and boots to keep thing simple and chic. this is actually what i perceive, and observed, as the quintessence of the parisian woman: elegance, simplicity, effortless chic. i just wish i went to a fancier place than work in this ensemble. well, maybe next time. It really is a skirt that need to be celebrated. I guess you can find the most exquisite things in Paris. 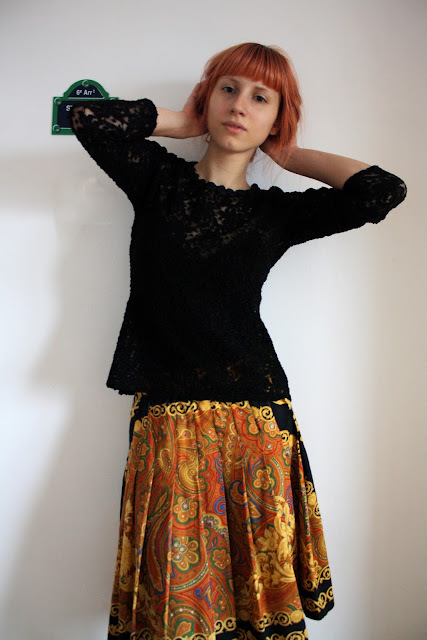 You had a great idea to wear with a simple lace top since the skirt needs all the spotlight and love your hair here. I just saw you on Chictopia, and your blog is fantastic! I'll definitely be following you now! i love that your top is interesting because it's lacy but also simple because it's black and doesn't overwhelm your skirt. :) very sleek and elegant look.